President Coolidge with Tiny Tim, a red chow. Although President Coolidge had a soft spot for dogs. In fact, about a dozen dogs — and a menagerie of other animals — made their home at the White House during his administration. Tiny Tim was a red chow puppy who was a birthday gift for the president. Apparently the dog and President Coolidge shared the same birthday — the Fourth of July. Although some accounts report that Tiny Tim earned the nickname “Terrible Tim” for his household antics, the dog was still very much part of the family after the Coolidges left the White House. Photo from The Milwaukee Sentinel showing Grace Coolidge holding Tiny Tim, a chow. 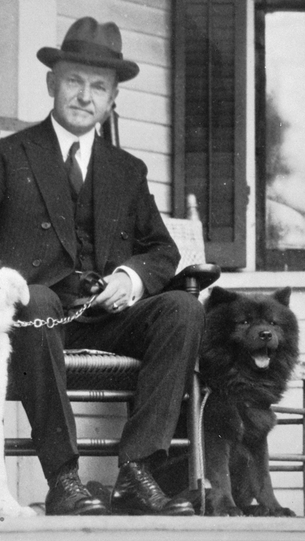 The Coolidge family, who also had a chow named Blackberry, was instrumental in introducing the breed to most Americans. Although a chow named Takya was the first chow to be exhibited in the United States and won third prize in the Miscellaneous class at a Westminster Kennel Club Dog Show in 1890, it wasn’t until people saw photos of Tiny Tim that the breed a became popular choice for a pet here.